As at previous Jubilees, space will be available for individuals and companies wishing to make their products or services available to Jubilee attendees. 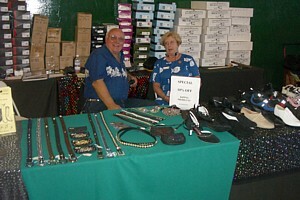 We expect there to be vendors offering such products as square dance clothing, shoes, accessories, and records. If you are interested in being a vendor at this year's Jubilee, see the detailed information below. Individuals and businesses may also advertise in our program book. 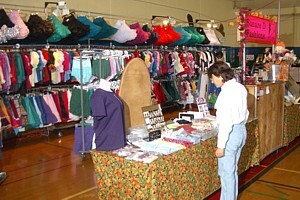 Vendors may begin setting up in the hall Friday morning. Vendors are asked to be open for business by 6 pm Friday and not to begin closing down until 5 pm Sunday. RV parking is available near the dance hall for $23 per rig per night, payable in advance. Vendors may arrive for RV parking on Thursday. A $100 deposit is required to hold your space(s). Balance for multi-space rentals is due by 8 October unless special arrangements are made with the Jubilee General Chairman. Deposit is not refundable after 1 October. You may buy an ad in our program book at a discount of $5 for each 10' by 10' vendor space you have rented. Shared spaces may be available for $60 per vendor -- if you are interested in sharing a space with another vendor, check the appropriate box on the vendor rental form, and we will put you in touch with another vendor hoping to share a space. Shared spaces may have up to 2 tables and 4 chairs if needed. To reserve space, complete and return the vendor rental form with your deposit. For additional information contact the Jubilee General Chairman at jubilee@scvsda.org.